Jason Podlaski transforms shattered skateboards into edgy pieces of furniture that are built tough. 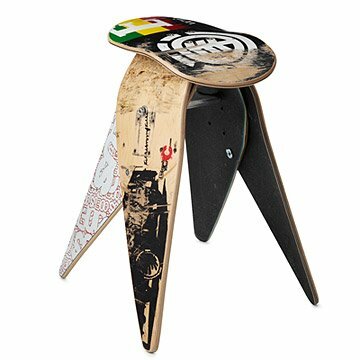 Add a kick of street style to your home with this sturdy, compact seat that features a creative reuse of of roughed-up skateboards. Broken boards are byproducts of skate culture and decks are usually destined for the landfill once they're cracked. Inspired by the consistent way many skateboards were busted, artist Jason Podlaski collects shattered skateboards from skateshops and skateparks in the US and Canada and turns both deck and truck into a hybrid, high-quality piece of furniture that's built tough. The scrapes and scars on the decks create a beautiful veneer of use over the original graphics. Every deckstool is meticulously built, reinforced and finished by skilled craftsmen in Pennsylvania. It all began when Adam Podlaski approached his brother, Jason, and asked him to salvage the remains of what appeared to be several broken skateboards. Jason realized that not only could the pieces be fashioned into stools but that most skateboards tend to break in similar spots - at the truck or, simply, in half - lending themselves perfectly to legs and seats. Now, instead of being chucked into landfills and discarded, broken skateboards could have a second life as furniture. After all, with providing hours of fun and freedom to their owners, they deserved a more dignified retirement. With quality and authenticity in mind, Jason takes special care to preserve the scrapes and scars that make every board, and stool, unique. Due to the variable nature of recycled skateboard decks, every stool is unique and will feature a one-of-a-kind combination of scarred skateboard art, scrapes/bangs, colors and graffiti. The decks for each stool are carefully selected by hand in order to be complimentary, much like a woodworker would select lumber for a piece of fine furniture. Despite the fact that every stool is unique, we have engineered our production process to insure all furniture meets our strict quality and dimensional specifications. We do produce every piece of furniture to be balanced as far as "quality" of skateboard art, colors, and graffiti included in each stool. My brother loves the stool. Great gift! My boyfriend LOVES this stool. It adds a nice flare to whatever surrounds it. It's used while browsing a vinyl shelf unit so one doesn't have to crouch or squat uncomfortably. I'm actually getting another for him !!! This is the perfect gift for a skateboarder (past or present). Perfect for my son's room... Small in scale, but it is standard height... works at his desk, or just for additional seating. Plus, it is incredibly cool! Our 42 year old is an avid boarder... He is going to purchase another for his 2nd home. A must for any skate enthusiast. My son has skateboards hanging all over his room and several on the floor that he rides. He is going to love this! I love that they are recycled - extra bonus! My husband loved this gift. It is so unique, I don't think I could have found anything more fitting for him. I don't know that we will use it, but it is a beautiful piece of art if you have a love for skateboarding. Bought this for my boyfriend! Purchased as a wedding gift for a 20-something couple. He is a skate boarder and will absolutely love it! Wonderful, unique item. Was thrilled when it arrived!! I want to Love it, but do not. I wanted to love this product, it is a gift for a former skateboarder. When it arrived I was convinced there was some mistake. After reading the description more closely it does say the accurate height. The photo however, makes it look like a stool that could be used at a desk or bar etc. This could only be used at a child's table or as a step stool.